Read the Holy Quran in Arabic alongside its translation. Provides verse by verse audio playback, color coded Tajweed, repeat functions, unlimited bookmarks, search, excellent navigational controls, several translations and reciters and much more. 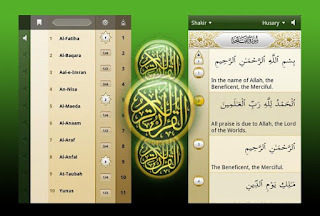 * Color coded Tajweed (Pronunciation) Rules, the first and only Qur’an software to offer live rendered Tajweed rules.